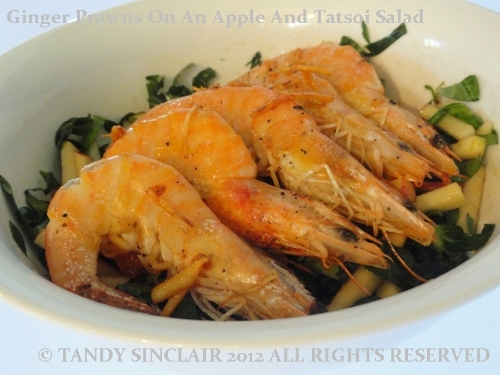 This recipe for ginger prawns on an apple and tatsoi salad was developed by me for Woolworths Chopping Board Chit Chat. Saturday’s for me are my day to spend in the kitchen, creating and enjoying. This past weekend Dave was at the race track and I was happily minding my own business, making pastry. Out of the corner of my eye I saw someone walking through our property and I rushed into action. First I locked the back door, then I ran up the stairs and set off the panic alarm. We live in such a quiet neighbourhood that the panic button is really only there for the house sitter. She asked for one as she looks after our house alone, and so I have placed it on a red ribbon, next to the bed. As I pushed the button, I noticed a Telkom van parked outside our neighbour’s house. The alarm sounded and I ran down the stairs, to turn it off as the actual panic code activation is meant to have the armed response arrive straight away. We also only have armed response as the insurance company insists on it, not because I think we need it. Two cars pulled up and the two armed men came onto the property and discovered that the gentleman from Telkom was on our property fixing the next door neighbour’s phone line. The servitude is on our property, but he was still trespassing. I had a moment of SCARED followed by minutes of ANGER that he had dared invade my space that way. I would have had him arrested for trespassing but as he was not actually on my property when the armed response arrived – he had quickly jumped over the wall, using his ladder – they could not detain him while the police were called. I decided after this not so nice experience, I needed a nice lunch. Prawns are a sure way to make you feel better! Lovely recipe, Tandy, and I mean it: I am writing this very early in the morning before breakfast! What an experience and how stupid some people can be. It would have been so easy just kindly asking for permission – idiot! I hope you had a glass of lovely white wine with the shrimps? You are welcome, Tandy, I really like your site and particuarly look forward to the food quiz each Friday! Just look at hoe delicious those prawns look. I am so jealous I can’t have this dish right now. I love the flavors as well. I would be sacred too…the prawns look awesome with apple and ginger. Not a nice experience – we should feel safe in our homes and he invaded your sapce. As you say, all he had to do was ask. I hope you had a huge glass of wine with those lovely prawns to calm your nerves! Ugh that sounds awful! THey should have at least warned you that he was coming onto your property! Sorry to hear about the scare! The prawns are looking delicious! I love ginger! Was eagerly awaiting this recipe – delicious. Those prawns look and sound delicious. And such a simple recipe too. I think I might try them for dinner next week. Tandy, I made this last night and it was outstanding. I loved the simplicity of the salad – I would never have thought to julienne an apple like that in salad but it is a little tip I will remember. Great salad dressing and perfectly cooked prawns. It got a big thumbs up from my husband also. Thanks for the recipe. It’s definitely a keeper. the tequila looked very tempting! that is all he had to do! we live in such a safe area but I still would not be complacent!